So wrote Peter Brinson in the 1990s, near the end of a career dedicated to dance. But who was Brinson and why is he important to the history of the Faculty of Dance at Trinity Laban Conservatoire of Music and Dance? Brinson was born in Llandudno on 1920. After serving in the Second World War he took first-class honours at Oxford University in Politics, Philosophy and Economics. He then became Director of Research at the Film Centre in the early 1950s. It was around this time that he saw ‘The Green Table’, a ballet by Kurt Jooss, being performed at the Oxford Playhouse, and ‘Les Sylphides’ performed by what was then Sadlers Wells Ballet at Covent Garden, and became captivated by dance. He took two ballet classes a week for the next three years and regularly saw all the repertory of the Sadlers Wells Ballet thus building a knowledge of classical ballet. He began reviewing ballet performances for ‘The New Statesman’ , eventually becoming dance critic for ‘The Times’, the ‘Observer’, the ‘Sunday Times’ and the ‘Financial Times’ whilst also giving lectures on ballet and dance at Oxford, Cambridge and London universities. 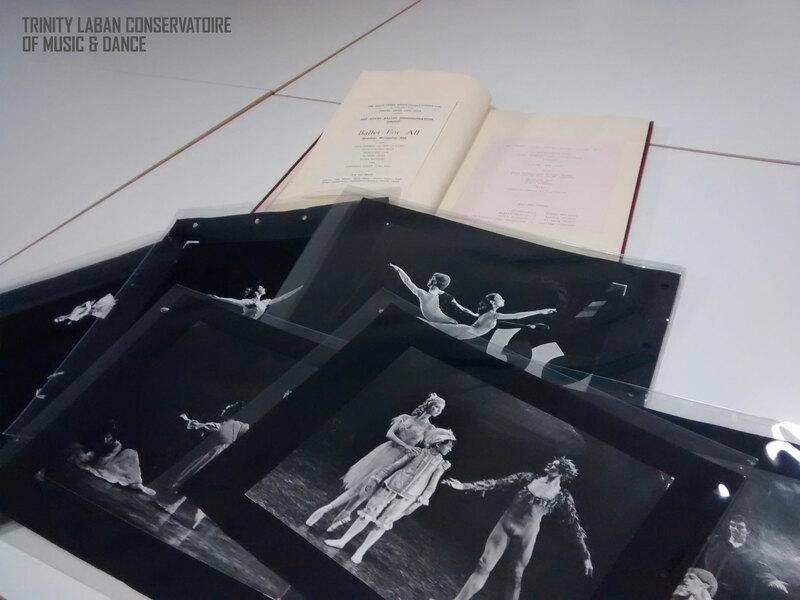 He also co-authored a book ‘The Choreographic Art’ with Peggy van Praagh which was the only book of its time to combine the history and practice of choreography [copies are available to view in the Laban Library and Archive]. 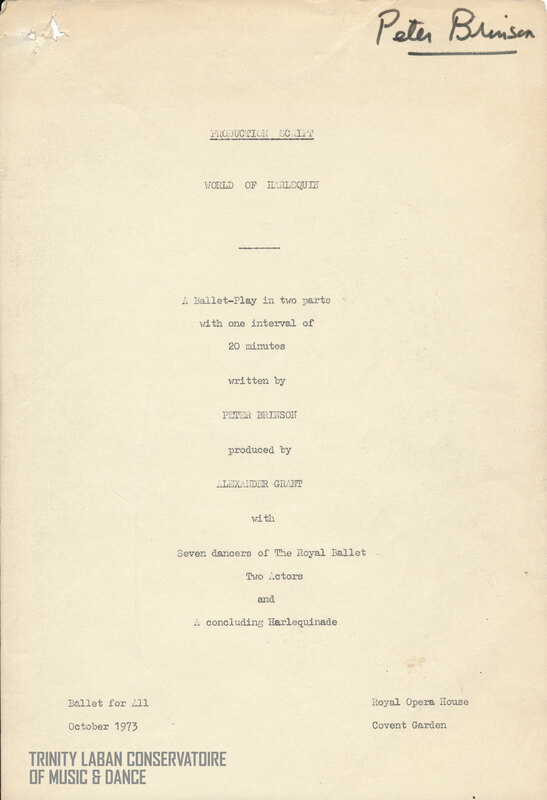 He also wrote ‘Background to European Ballet’ which was the result of research funded by the Council of Europe and the British Council. Brinson’s dance lectures for the Oxford University Extramural Department developed into lecture demonstrations where he would take dancers with him to demonstrate ballet technique and dance excerpts from classical ballets. Around this time Brinson was asked by the newly formed Gulbenkian Foundation, a charity focused on fostering knowledge and raising the quality of life of people throughout the fields of the arts, charity, science and education, to look at how the Foundation might help dance in the UK. He suggested that a small touring unit be formed that would tour nationally taking ballet into the towns and villages of the UK. He was invited to apply, successfully, for a grant for such a unit, and thus ‘Ballet for All’ was born in 1964. Ballet for All developed a formula whereby a ballet master, six dancers, two pianists and two actor-narrators could both entertain and instruct, with scripts written by Peter Brinson in the form of ballet-plays. The dancers were seconded from the Royal Ballet Touring Company. Ballet for All proved to be very popular and Brinson continued to lead it into the early 1970s. Its influence continues today as most major dance companies have educational units that are considered a crucial part of their work. Following a brief spell as Director at the Royal Academy of Dancing in 1968-69, Brinson was offered the job of Director of the Gulbenkian Foundation in London which he took on in 1972 and held until 1982. It was here that he began his campaign for recognition of and help for the arts. He set up and chaired an inquiry into Dance Education and Training in Great Britain (published in 1980), which assembled for the first time, detailed statistics and laid out a national plan for dance. It was as a result of this inquiry that Europe’s first Dance Department, at the University of Surrey, was established in 1981. 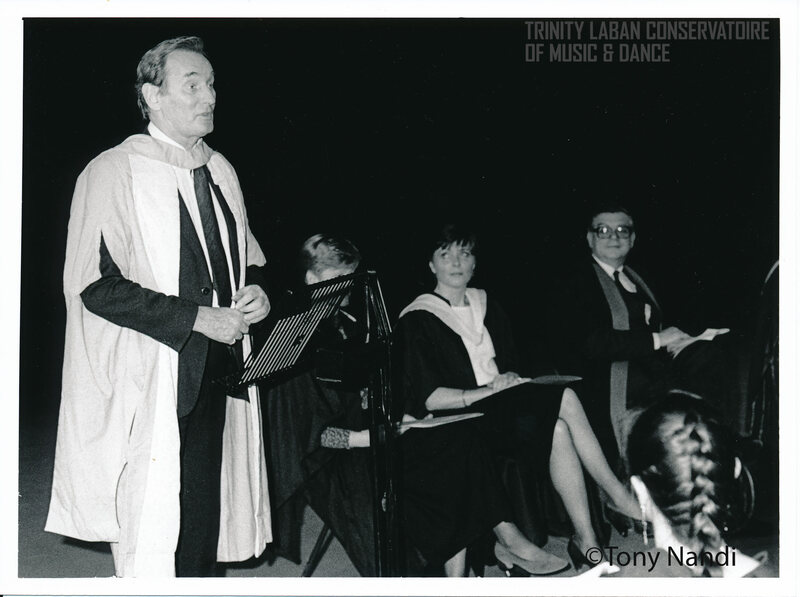 Whilst still at the Gulbenkian Foundation, Brinson became the Chairman of the Dance Board at the Council for National Academic Awards from 1975-1984, which validated the pioneering BA (Hons) in Dance Theatre at the Laban Centre (now the Faculty of Dance, Trinity Laban). During this time he also sat on the validation panels at London Contemporary Dance School, Middlesex Polytechnic (now University) and other centres. 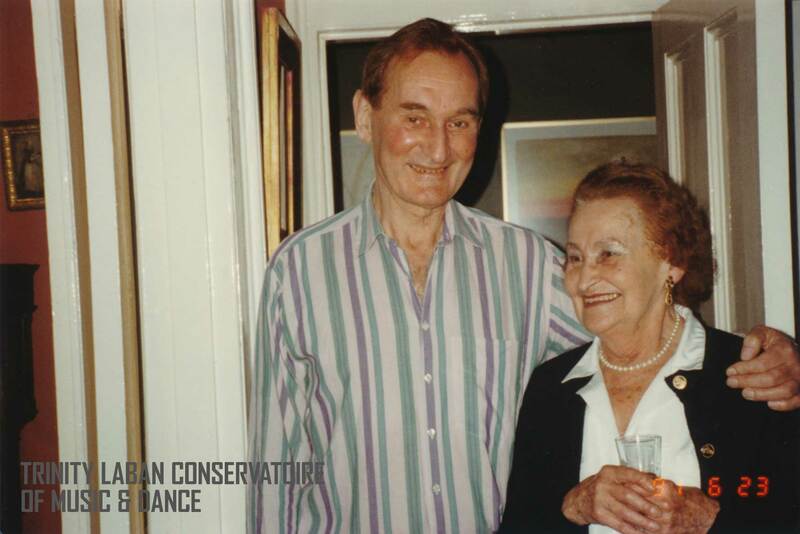 At the Laban Centre Peter Brinson launched the one year Community Dance and Movement Course (later validated as the Postgraduate Diploma in Community Dance) and became Head of Postgraduate Studies. He initiated the Sociology of Dance and Politics of Dance courses at undergraduate, MA and research levels and continued as a consultant at the Centre until his death in 1995. On his death, Peter Brinson’s papers were given to the Laban Library and Archive as the Peter Brinson Collection. The Collection can be accessed via the archive catalogue . Brinson’s influence was in no way limited to the UK. As his reputation grew over the course of his career he was invited to speak at innumerable international conferences and to carry out research projects and write reports on dance for governments all over the world. He wrote many articles and papers and published many books over the course of his life – some of which are available in the Laban Library and Archive. 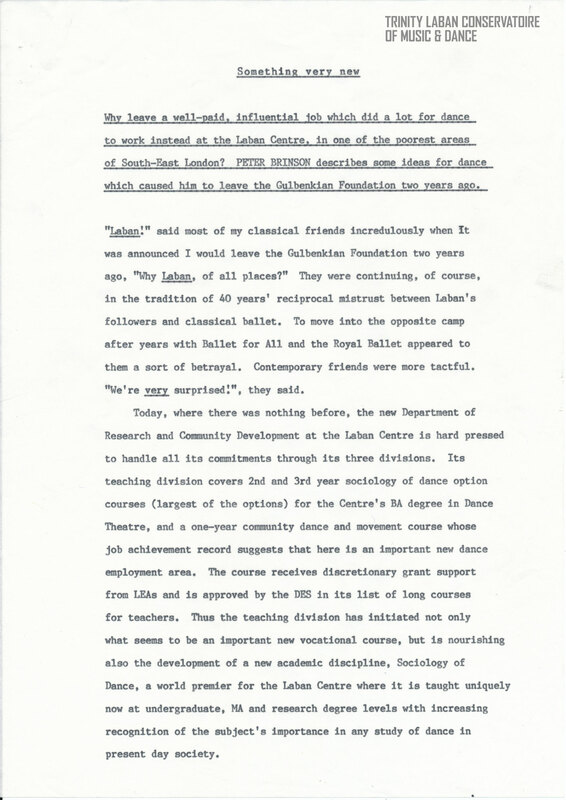 This entry was posted in 70th anniversary Faculty of Dance, Archive and tagged 70th anniversary Faculty of Dance, Archives, Ballet for All, community dance, Gulbenkian Foundation, Peter Brinson, Peter Brinson Collection, Trinity Laban Conservatoire of Music and Dance. Bookmark the permalink.